With the warming days of summer upon us, it’s important to guard your dog against heat stroke and to know the warning signs of heat stroke before it becomes life endangering. 1. Provide your dog with plenty of shade and cool water to drink when outdoors. 2. Provide your dog with a kid’s wading pool of water to cool off in. 3. Bring your dog indoors especially during the hotter parts of the day. 4. Never leave your dog in a vehicle when the temperature is above 70 degrees and in the sun. Cracked windows will not give enough ventilation for your dog nor allow the heated air that is building up inside your vehicle to escape. Basically, if it would be too uncomfortable for you to sit in your car, it’s too hot for your dog as well (the same rule applies for your dog in the winter time too). 5. Limit exercise (playing with other dogs, playing fetch, walks and runs, etc.) to cooler parts of the day. 6. 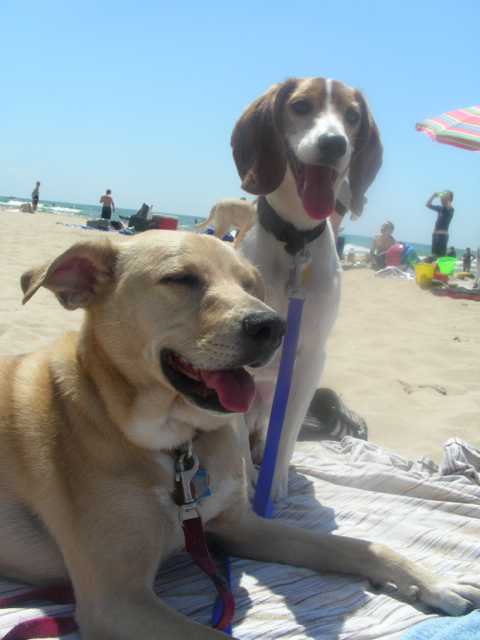 Take your dog to a dog friendly beach for some cooling off swimming fun. 7. If your dog becomes overheated, place cool compresses under your dog’s armpits and groin area. You can also cool down the pads of your dog’s feet or place him/her in a kid’s wading pool or a bathtub filled with cool water. Dousing your dog with cool water will have little impact due to the fur which effectively wicks the water away. If your dog’s conditions don’t immediately improve or if your dog is very lethargic, take your dog to your veterinarian. Once your dog’s condition has improved, you should still take your dog to your veterinarian as soon as possible, to rule out any resulting health complications of having had heat stroke. Knowing the signs of heat stroke and the 7 tips to keep your dog cool will make sure you and your dog enjoy a safe warm summer together. For more helpful tips and to inquire about dog training, contact Michigan Dog Training LLC. This entry was posted in Health and tagged cool your dog, dog, Heat illness, heat stroke in dogs, Michigan Dog Training, signs of heat stroke. Bookmark the permalink.